Jaaaysus that garden needs a lot of tidying up. I don't envy you as I had all that and more initially. But the euphoric feeling when all done is a great buzz. 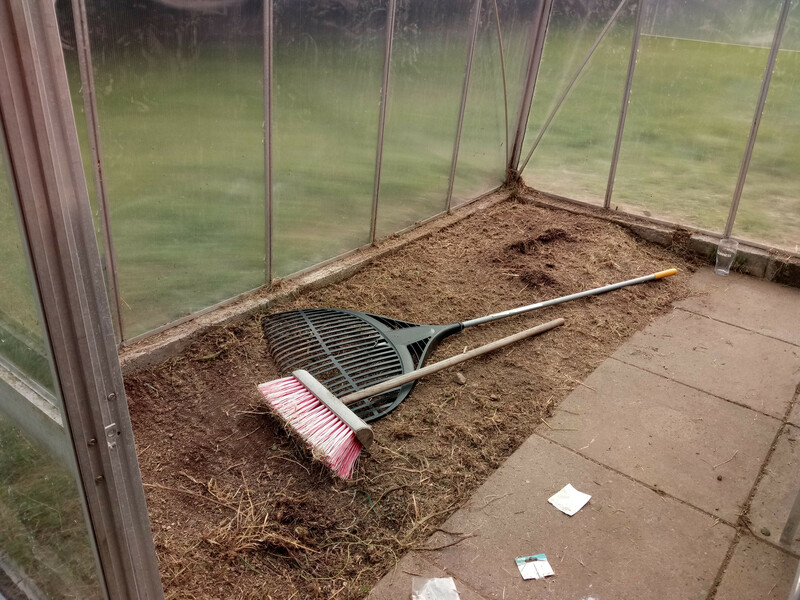 I had a mare with my greenhouse too, I think I did a link to it on a previous post on this thread. But all is good now and I wouldn't be without it now. I can spend hours in there, hours of total relaxation. yeah that's the messy bit of the garden. 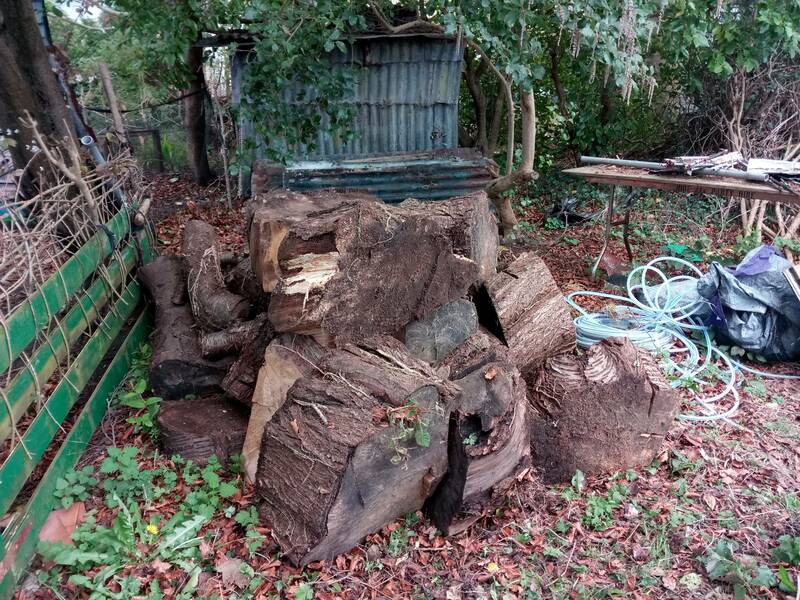 it's where the composting and firewood and all that sort of stuff happens. 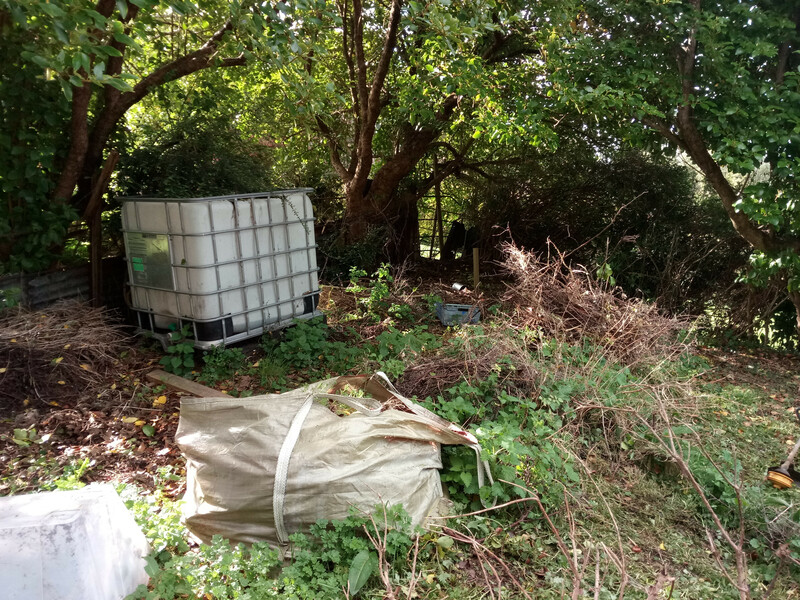 the bit where the greenhouse is, ok it's not imaculate.. but it was essentially a meadow full of crap a few years ago, so the fact that i can mow it now feels like a victory every time heh. yeah i've wondered about hiring a big shredder every now and then. will definitely think about it. on the greenhouse, i've ordered enough polycarbonate to do the whole thing. not all the glass is useless, so i should have a good pile of spare bits after this. will see how it goes. cheers for the greets yo. Hi, Cravings! Are you using what you've got? Or trying to build what you want? You mentioned that the neighbour's wall is on the north side of your garden, so you're positioning your greenhouse exactly where it should be, i.e. aligned east/west and facing south. You also talked about needing a shed, so have you pondered the notion of combining the two? Modern proprietary greenhouse design isn't ideal and, if you ever go round one of the stately homes, you'll note that they're invariably built as lean-tos against an existing building so that short plants go at the front (south) and all the others rotate by height towards the back, all getting their fair share of sun, unlike the modern bought ones that leave everything over half way back shaded by those in the middle. In the stately homes all the hardware was kept in the building behind so as to leave maximum space for growing plants, i.e. what it's for? 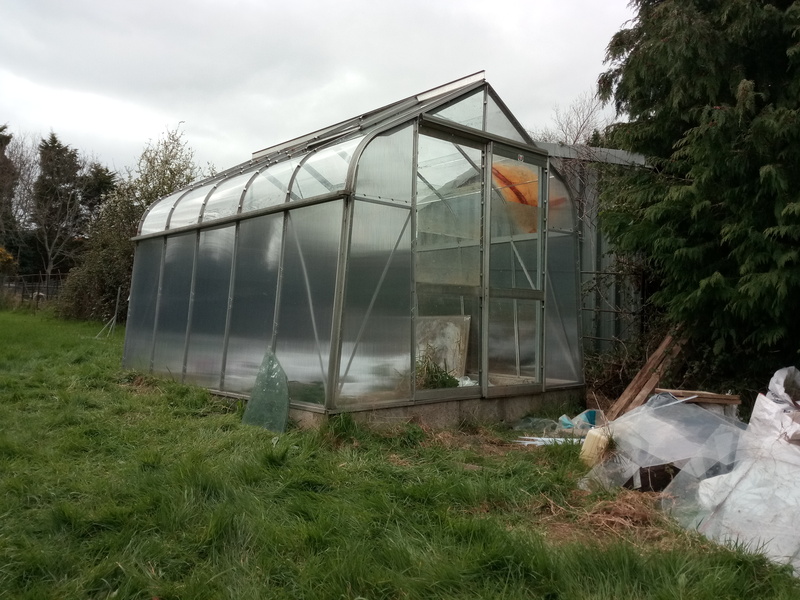 The average home greenhouse today accommodates a potting table, bundles of canes, bales of peat etc., all cluttering up the growing area, whereas, if you sit back and give it a good old dose of looking at, you may come up with a design that has an off-centre pitched roof, most of which is on the south side. 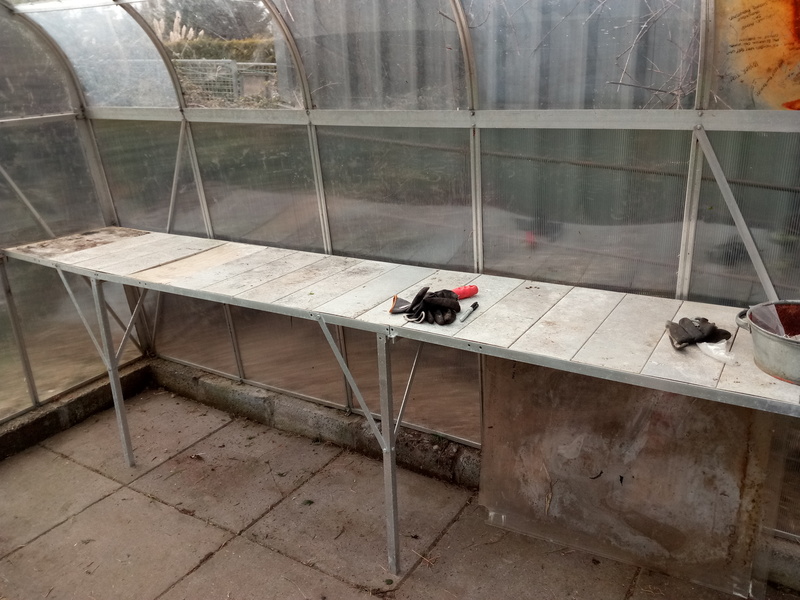 The shorter unglazed (north) side acts as your shed so that, if you need a couple of canes or some pots, you can pop round the back and get them. This may not suit you. You might not intend to stay there that long but, if I can quote from the immortal Tagwex, do it once and do it right? To avoid the above problem you need to think outside the box and build a reverse lean too bespoke conservatory. I purposely didn't give every detail of what I had in mind but the rear shed part would accommodate a water tank, filled off its roof, and with a tap through into the glazed section. A dividing wall formed out of lengths of overlapping soffits and coated with kitchen foil, would reflect sun back into the growing area for maximum advantage, and a row of 'organ pipe' upright plastic pipes, painted matt black and filled with water, would store enough solar heat to keep night frosts away. If he wants more info, he knows where to come. it's a weird combination of using what i've got, and getting what i want heh. the greenhouse is half bed, half paved, and it has a table that fits in along the paved side.. so when you walk in, there's beds on the left (south) and work bench on the right. and to the right is the neighbour's shed, there's probably about 3ft and a fence between them so we both have access to our structures. 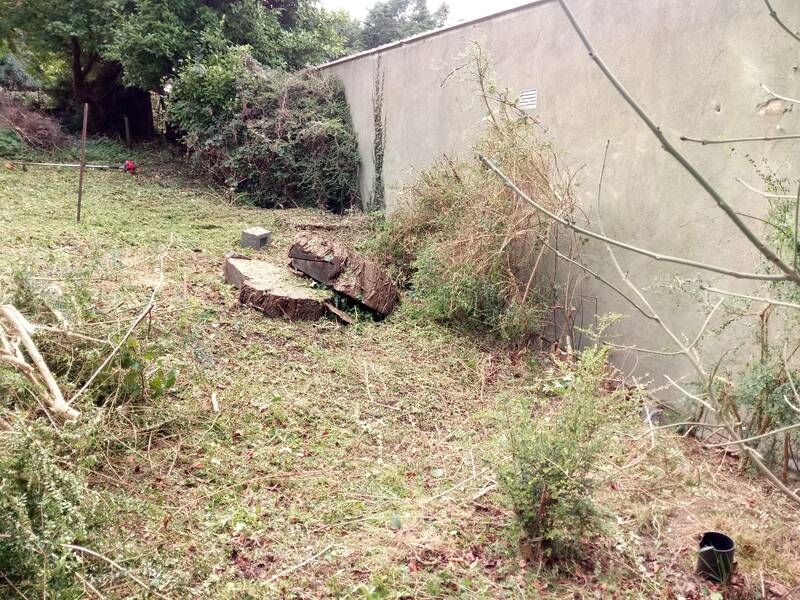 other section of the garden, the bit i'm working on now, does have a wall to the north, but it's the back of a building and it's about a meter from the boundary.. though right now the boundary is obscured by overgrowth.. we both agree on clearing this back, and putting a proper big retaining fence between us here. 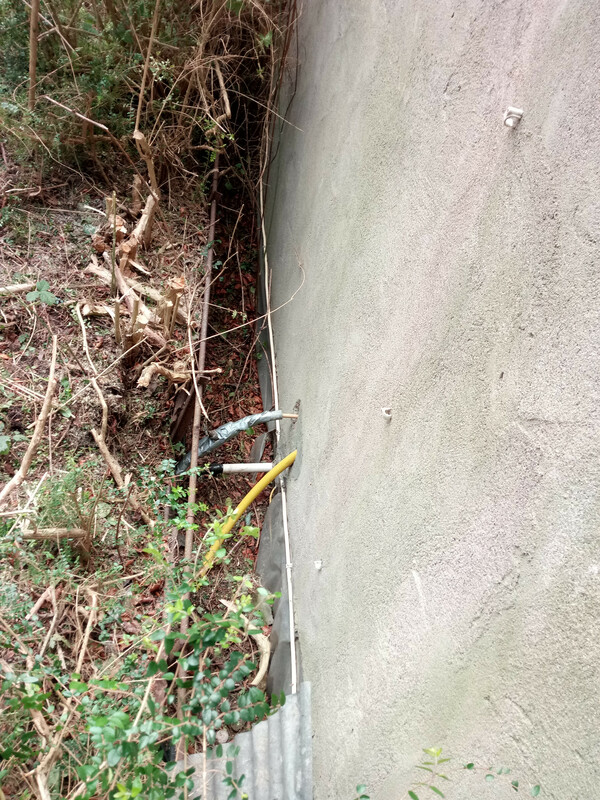 hard to explain here, but there's a drop of about 2 meters from my property onto his, and the original iron fence between us is kind of collapsing onto his side with the weight. so once that is done (i don't know when that will be done though..) i want to dig and pour a concrete slab for a metal garden shed on that spot.. and then build a big fenced chicken coop on the rest. 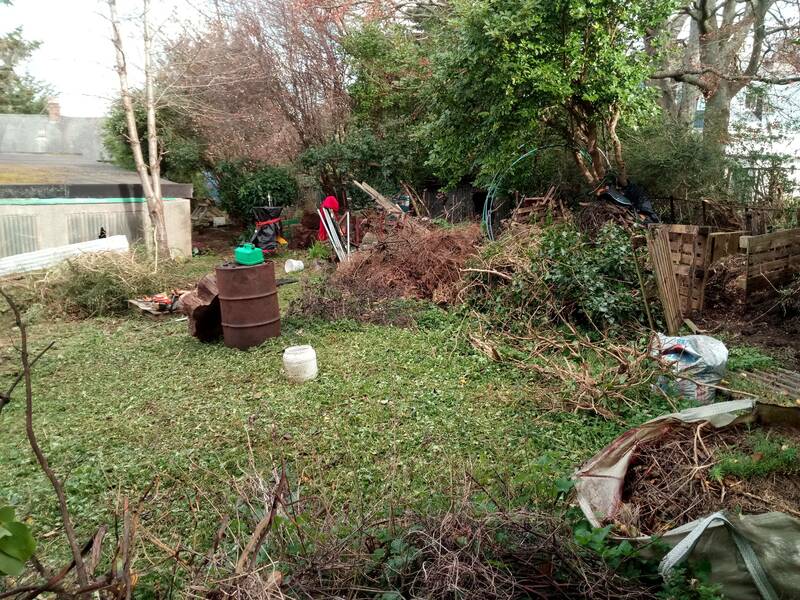 but before i can really start clearing that side of the garden.. i'm currently trying to clear up the other side a bit so the compost / firewood arrangement area makes more sense and is more workable / less cluttered.. and then i can start clearing the hedges and laurels and stuff along the neighbouring boundary. maybe i should make a tour video.. might explain it better. i've been doing more shredding. i can't decide if it's sort of therapeutic or tedious. just had a quick look for hire prices for a bigger petrol shredder.. minimum 70 a day up to about 100. and the time spent going wherever to get it and bring it back etc.. there's this one on donedeal.. hmm.. youtube videos of it aren't great but it should munch through stuff fairly quickly. tbh it's easy to just spin in circles here. it's a lot of space, and i have got on top of a lot of it.. but you can spend a day walking around lifting things up and putting things down, feeling busy and getting tired but not actually getting anything done. so i'm trying to focus on these listed tasks. 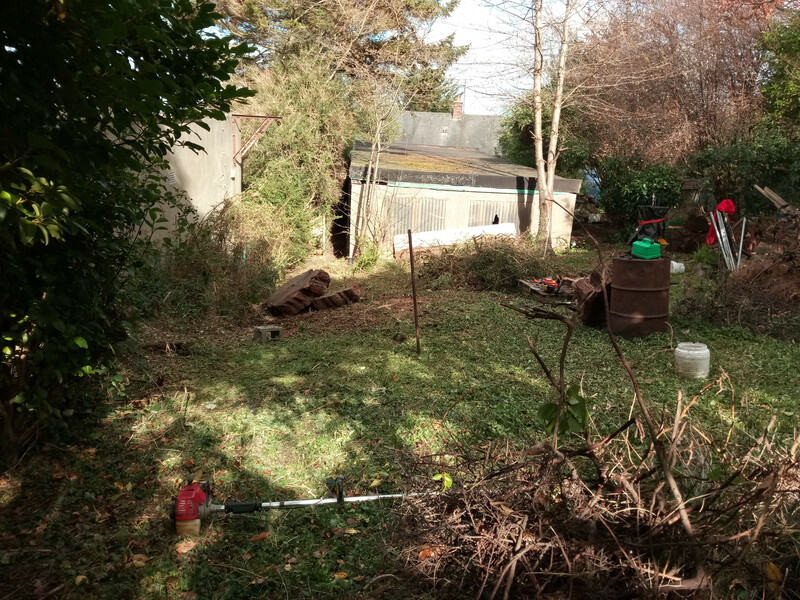 get the greenhouse finished, get the "middle garden" cleared, and get the shed / fence situation done. and around that just keep mowing the lawn and stuff. a meandering post again by me heh! and i am thinking long term here, i own the place and love it. thanks for all the encouragement. i might make ye a quick video of the whole situation. progress is kinda slow. it's growing in front of my eyes! 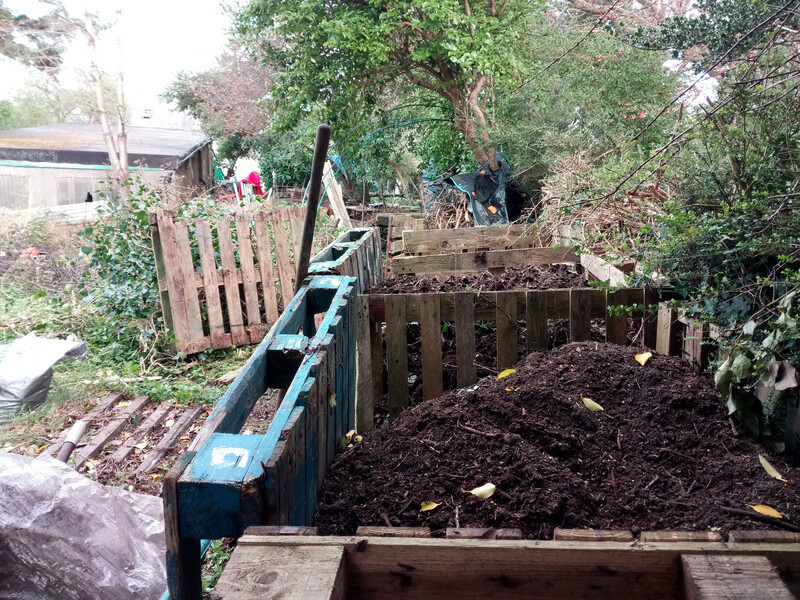 what have i got done these last few days then... i've pretty much tidied up the compost situation. it had got a little messy. i consolidated 2 "bays" (i'll call the pallet boxes bays) into one.. turned over the next one, and kind of started another. so i have one cubic meter or so ready to go.. somewhere.. will lose some to the greenhouse, want to make a berries bed, yeah anyway.. so the next bay is pretty close to ready, whenever i've emptied the ready one i'll just turn it over into that space and i'm sure it'll be done by then..
given up on the shredder. i'm gonna make a big heap, not let the garden start growing around it.. hire a big proper shredder for a day and spend a day on that. soon. i'm gonna cut a pile of hedge back i think with this in mind. a few years ago there was a big tree felled.. all the manageable bits of wood were dealt with.. but there have been a few big huge rings i can't lift or move, lying around for years.. so i've been stressing my little chainsaw and slowly cutting them down to slightly more manageable sizes..
there are still a few to deal with. this next pic shows a bit of the boundary. me to the left of the metal fence, neighbour to the right. this bit there's only about a meter height difference.. but as you go up the garden, past his building, it gets to about 2 meters, and it overhangs a lot, with a lot of growth. 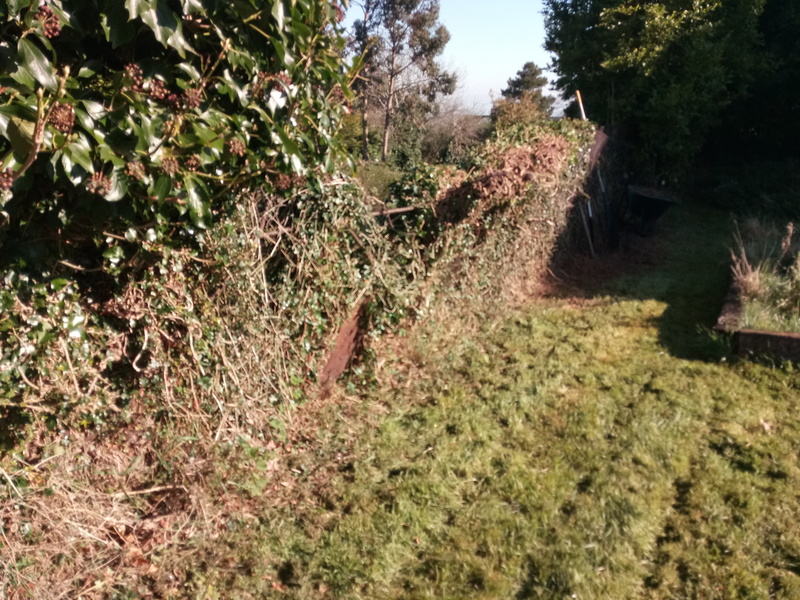 so this is me making a start at clearing this boundary to get ready for whenever a digger is available to put up a mega retaining fence. had a chat with the neighbour about this the other day so it's on the cards, so to speak. you can see how the ground on my side slopes up relative to his building here..
this is the spot for the shed, under the trees. it's also where the overhang is the worst. shed is about 4x3m so quite a bit slab but it'll fit nicely with about a meter behind, even when the boundary is straightened out. and a couple of photos of the general state of the place..
strimming today felt good. most of my scheduled work happens at weekends (i work in the night club industry mainly) so this is where i stop this for now, and get busy with other stuff. i'll mow the lawn next week and start on the greenhouse too.. i swear! 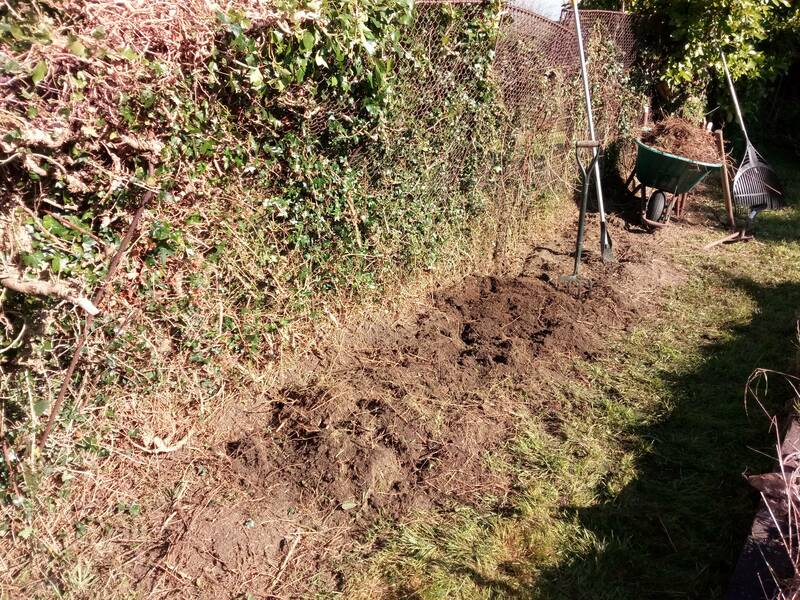 obviously needs a lot of digging and composting and all that stuff.. but it's done! will see if the polycarbonate holds. the top is still perspex on the curvy bits, and glass otherwise. took the bent bits one by one and straightened them out easy enough.. hopefully get the summer out of it anyway. so.. yeah.. tomatoes, have some red pepper seeds.. what else should i do? don't want to go mad, but the bed is 1m x 3m so i can do a fair bit i'd say. will tidy up that area a bit then it's back to the other chaos. boom. Peppers take up a lot of space as the plants are quite bushy plus they have a long growing season and might just be a little late growing from seed. As you know you don't have much growing space so something smaller may well yield more in the long run. Well done you, that's looking great! 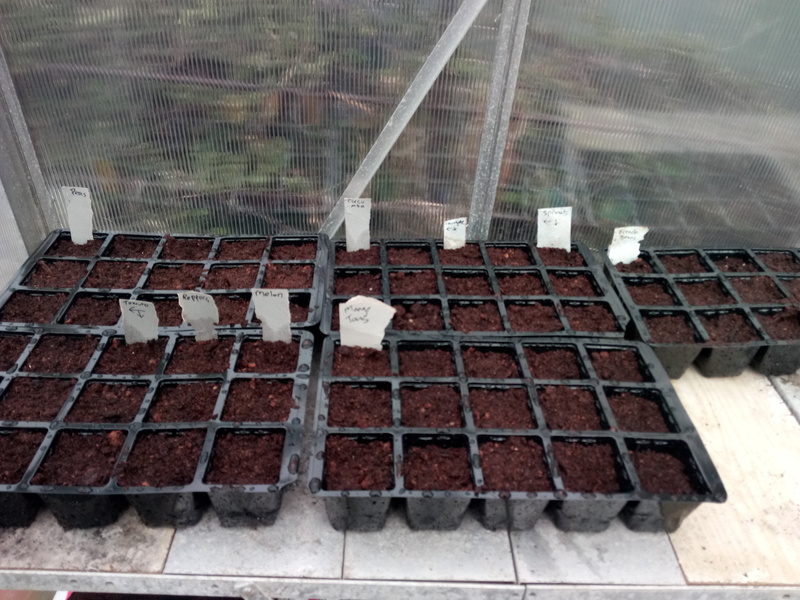 Depends if you like them, but a friend of mine had great success with a couple of aubergine plants in her first year of having a greenhouse - having never grown anything before. I love them but don't have the space with my small greenhouse. i know i'm late and all.. but sure it's just for fun, i'll see what happens. nothing germintated yet. but the greenhouse heats up amazingly. it's great in there. whopper weather here this weeend for the garden too. really enjoying it. anyway.. yeah.. chipping away at that. 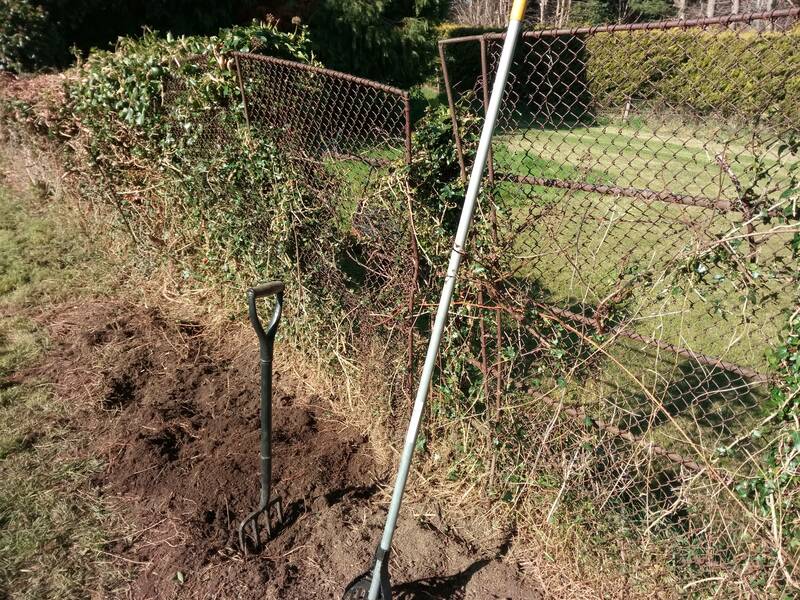 digging through years of long grass, just digging out all the roots i can. 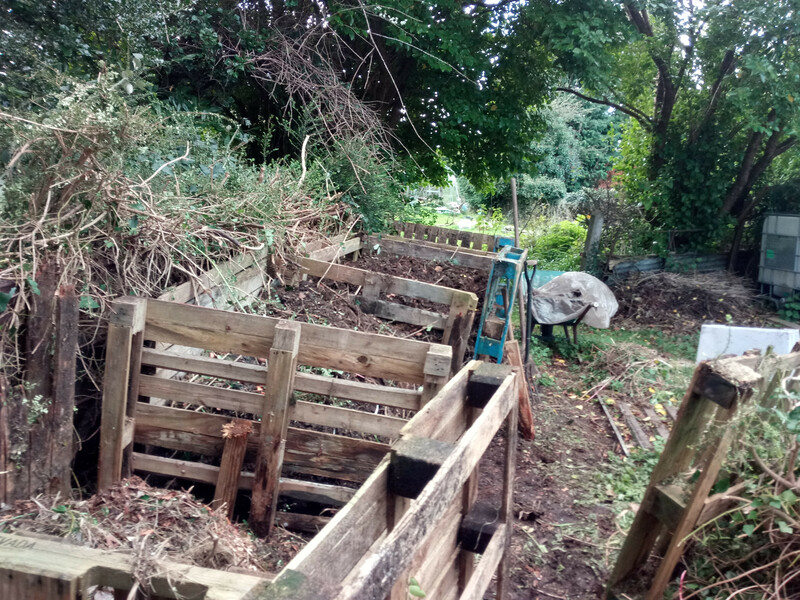 haven't decided to make it a raised bed or not.. i have loads of compost to lose so raising it would help with that.. also make a good edge for mowing along. decisions decisions. anyway, not quite at that stage yet. much more dgging to do. I have a distraction too this weekend. It's called Augusta!!! I should be in the greenhouse too. heh i had to google that.. it means you're watching golf. good stuff.